Three cheers for the eagle. 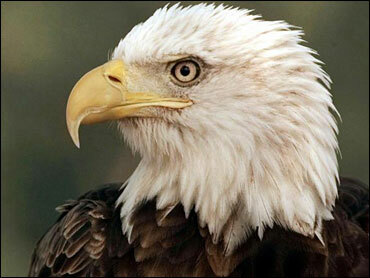 The bald eagle was removed from the list of threatened and endangered species today. It's quite a comeback for the national symbol that was in big trouble back in the 1960s. In 1967, there were but 417 nesting pairs in all of the lower 48 states. Now there are more than 10,000 pairs. The eagle was disappearing because of the widespread use of the insecticide DDT. Farmers sprayed DDT into local streams and rivers. The eagles ate contaminated fish and, while the DDT didn't kill the birds, it rendered their eggs inviable, and the great birds began to die out. However, once the use of DDT was banned, the birds mounted a comeback. Bald eagles are everywhere nowadays, even in places where many adults have never seen them before. I'm sure there was a terrible holler and cry when DDT was banned. How will the crops survive? What will this do to the economy? Well, the corn's still growing ... and the eagles are soaring.